Depending largely on one’s political views, one may consider film-producer and activist Michael Moore as either as an American patriot (left-wing) or a traitor (right-wing). His progressive views and causes are well known, as is his passionately aggressive approach in projecting his socio-political-economic views in films he creates and produces. – SEF News-Views Digest by CFS member Clif Ware. Moore’s latest film—Where To Invade Next (a documentary-travelogue)—is acknowledged as his most influential project to date. Not surprisingly, I found it to be both educational and entertaining, and was amazed at the findings he reveals. It seems other countries have adopted some of America’s past progressive ideas and practices, even though they’ve either been neglected or rejected over time. Moore’s primary objective was to undertake a fact-finding mission, by visiting selected countries to either claim or reclaim certain highly successful practices for the U.S. He ends each segment by planting Old Glory on the spot visited, symbolically claiming each successful foreign practice for the U.S.
Countries visited (and practices studied) include: Italy (8 weeks paid vacation leave for workers): France (nutritious multi-course school meals); Finland (no standardized tests, no homework); Slovenia (free university tuition); Germany (public education about Nazi past); Portugal (decriminalization of drug use); Norway (humane treatment of prisoners); Tunisia (equal rights for women); and Iceland (prosecution of bank and financial executives responsible for 2008 economic recession). We can certainly learn much from studying and adopting successful practices found elsewhere. I enthusiastically recommend this important film to anyone interested in creating a more enlightened, progressive, and sustainable society. 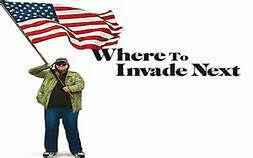 For more information, please read this article: Michael Moore’s New Movie Tries To Restore The American Dream By Showing Us What We’ve Lost; and view this trailer: Where to Invade Next Official Trailer 1. When the full-length movie is available, I hope you will view it, and be inspired by its positive message. > Common Dreams: Movements, Not Presidents: The Nationwide Fight Against Neoliberalism (Jake Johnson). The last several decades have been characterized by rapid accumulation of wealth and income at the very top and stagnation for nearly everyone else; as a consequence, the middle class has withered and extreme poverty has soared. Workers are exploited, public services are privatized, nature is commodified, and the needs of the population are subordinated to the needs of the market. If there is any hope of fundamentally altering the obscene imbalance of power in the United States, it is not to be found in corporate boardrooms or in the platforms of the nation’s two dominant political parties. It is to be found, rather, within the movements cultivated by those organizing in opposition to perpetual war, unfettered capitalism, systemic racism, and environmental degradation. > NPG (Forum Paper): Crushing Biodiversity With The Weight Of The Human Race (Leon Kolankiewiez). As a Peace Corps Volunteer in Honduras the author was invited to help lead a fact-finding mission into the Río Plátano Biosphere Reserve and La Mosquitia, the largest remaining rainforest wilderness of this ecologically stressed Central American nation, which had the lowest human population density in Honduras. Within two decades the region has been overcome by human population growth, resulting in clear-cutting of luxuriant rainforests and near extinction of some flora and fauna species. Since the dawn of history, the multiplication of humans into virtually every habitat on Earth—has occurred to the great detriment of countless other organisms. The assault on biodiversity began in pre-history, even before the advent of agriculture, accelerated under the agricultural revolution, and exploded with the industrial revolution and accompanying human population boom. > Resilience: The ‘Non-GMO’ Label Doesn’t Go Far Enough: Taking Stock of GMOs And Glyphosates (Jeremy Caradonna, Thierry Vrain). The total sale of products with ‘Non-GMO’ labeling is now in the billions. However, the Non-GMO label inadvertently shields health-conscious consumers from one of the scary reality that glyphosate, which is the main ingredient in the herbicide Roundup, is also being applied to non genetically modified crops. Worldwide crops of wheat, corn, cotton, canola, sugar beet, and alfalfa are genetically modified to withstand the application of glyphosate, in the form of Roundup—hence the label “Roundup Ready” crops. Glyphosate is a synthetic amino acid, a glycine analog that kills all plants except for the crop engineered with a bacterial gene that provides resistance to the herbicide. Numerous scientific studies since 2009 have shown that glyphosate inactivates detoxification enzymes, disrupts the endocrine system, damages the microbiome and immune system, and is carcinogenic. > Peak Oil: Accelerationism… And Degrowth? The Left’s Strange Bedfellow Aaron Vansintjan). ISE affiliate Aaron Vansintjan has written an engaging article that analyzes the strengths and weaknesses of two of the most widely discussed political tendencies on the left today—Accelerationism [high-tech future] and Degrowth [low-tech future]. By exploring their political priorities, vision, and blind spots, Vansintjan helps clarify two important sets of ideas that are animating political work today. What unites the two is a counter-hegemonic strategy that sets up alternative imaginaries and ethics, that challenges the neoliberal moment by insisting that other worlds are possible and, indeed, desirable. > E & E Publishing: Earth’s CO2 Levels Have Crossed The 400 ppm For Good (Brittany Patterson). The concentration of carbon dioxide in the planet’s atmosphere has surpassed 400 parts per million during the annual low point of the Earth’s CO2 cycle, and it’s not expected to dip below that threshold anytime soon. Last week, CO2 measurements at the Mauna Loa Observatory in Hawaii were consistently above 400 ppm. The National Oceanic and Atmospheric Administration’s lab has continuously monitored atmospheric greenhouse gas levels since the 1950s and is part of a network of labs across the globe cataloguing these measurements. On May 9, 2013, atmospheric CO2 levels rose above 400 ppm for the first time. Then, in March of this year, scientists at a South Pole observatory registered CO2 concentrations of 400 ppm, all but solidifying 2016 as the year global levels would surpass the threshold permanently. > Live Science-Climate Central: America’s Climate Plan Falls Short Of Its Promises (John Upton). The federal government will need to ramp up its fight against climate pollution if it wants to keep a key promise under a United Nations pact, new research from the Lawrence Berkeley National Laboratory shows. The U.S. pledged during United Nations meetings in France last year to reduce its greenhouse gas pollution by a little more than a quarter in 2025, compared with 2005. When it comes to living up to this commitment, the research showed current rules and policies alone would be insufficient. Less than a year after it was negotiated, the Paris Agreement is poised to take effect. Even if all countries keep all promises made under it, the goal of keeping global warming to well below 2 degrees Celsius (3.6 degrees Fahrenheit) may likely not be achieved. Efforts are being made to improve national pledges in the years ahead. > MinnPost: Another Record Month For Warming, As Science Looks Way Back For Parallels (Ron Meador). August 2016 was the world’s hottest month on record, according to the National Oceanic and Atmospheric Administration’s latest monthly report on global temperatures. Two prominent climate scientists said last week that current patterns are outside the normal range of conditions going back thousands of years at the least, and perhaps even 100,000 years. Even those conjectures pale next to those of a new paper published in Nature [read here], which concludes that the Earth hasn’t seen a warming trend of this size in at least 120,000, and perhaps 2 million, years. It marked “the 16th consecutive month of record warmth for the globe.” It also closed out a three-month period that, with an average land/sea temperature of 61.7 degrees Fahrenheit, was the highest for any June-July-August slice of summer in the post-1880 record. > Huffington Post: Addicted To Oil: US Gasoline Consumption Is Higher Than Ever (Lucus Davis). August was the biggest month ever for U.S. gasoline consumption. Americans used a staggering 9.7 million barrels per day. That’s more than a gallon per day for every U.S. man, woman and child. U.S. gasoline consumption has increased steadily four years in a row. We now have a new peak. This dramatic reversal has important consequences for petroleum markets, the environment and the U.S. economy. As incomes are increasing again, Americans are buying bigger cars and trucks with bigger engines, and driving more total miles. Last year was the biggest year ever for U.S. vehicle sales, with trucks and SUVs leading the charge. This summer Americans took to the roads in record numbers. This all illustrates the deep challenge of reducing fossil fuel use in transportation. > Grist: Record Rains Are Sending Untreated Sewage Into U.S. Cities (Climate Central). Record rainstorms across the U.S. in the past year have caused billions of dollars of flood damage and killed dozens. See the full report. Climate Central has found reports that millions of gallons of untreated sewage have been released into streets and waterways, with potentially dangerous outbreaks of waterborne diseases and often links to fish kills. When sewage overflows into homes and businesses, expensive remediation and decontamination is needed to make them safe again. But the full extent of sewage overflow is often undocumented and largely unknown. Climate Central’s analysis of more than 3,000 rain gauges nationwide shows that heavy downpours are happening more frequently than in the 1950s. With downpours projected to be even more frequent and intense as the world continues to warm, we can expect more of these costly and dangerous overflows for many years to come. > Washington Post: The Deepwater Horizon Spill May Have Caused ‘Irreversible’ Damage To Gulf Coast Marshes (Chelsea Harvey). The 2010 Deepwater Horizon oil spill has been called one of the worst environmental disasters in American history. A new study finds the oil spill caused widespread erosion in the salt marshes along the coasts of Louisiana, Alabama and Mississippi. Researchers say there’s a chance these marshes might never completely grow back. Marshes benefit humans, including acting as pollution filters, absorbing nutrients as they run off from the land before they get into the estuary, helping to suppress harmful algal blooms, and acting as breakwaters and buffering the shoreline from erosion. They’re also important carbon sinks, absorbing several times more carbon per unit of area than tropical forests do. And they also provide habitat to a wide variety of animals that are staples of human fisheries. > Think Progress: Crops That Account For Half The World’s Calories Will Struggle To Adapt To Climate Change (Natasha Geiling). More bad news for climate change and agriculture: A new study has found that the rate of climate change is likely to outpace the ability for key staple crops, like rice, corn, or wheat, to adapt. Together, these crops account for almost half of the world’s calories, raising concerns that climate change could lead to nutritional shortages around the world. The University of Arizona study only looked at wild crops, not cultivated species used in conventional agriculture, but the researchers said that the results could easily apply to cultivated crops as well. The study shows that wild crops are perhaps equally slow at adapting to shifting climate environments as their cultivated relatives. By the end of the century, decreases in crop yields could be as high as 25 percent. > Coastal Review: Studies Link Biofuel Demand, Habitat Loss (Brad Rich). As the U.S. and other countries have ramped up development of bio-energy as an alternative to fossil fuels, demand is rising for trees for wood pellets, or biomass, and agricultural products for liquefied biofuels. A recent multi-year study by researchers at North Carolina State University and the U.S. Geological Survey, detailed in two papers printed in August in the journal “Global Change Biology Bioenergy,” indicates that the increased demand could come with a cost: a loss of forested land, especially mature pinelands, and because of that, less habitat for wildlife. > MPR: 92 Percent Of World’s Population Breathes Substandard Air, WHO Says (Merrit Kennedy). The World Health Organization says 92 percent of the world’s population breathes air containing pollutants exceeding WHO limits, in new research released Tuesday. The new WHO air-quality model represents the most detailed outdoor (or ambient) air pollution-related health data, by country, ever reported., using information from nearly 3,000 places from around the world, doubling the amount of data from the last assessment of this kind. The research measured particulate matter in the air, such as sulphates, nitrates, ammonia, sodium chloride, black carbon, mineral dust and water, but not such known pollutants such as nitrogen oxides or ozone—meaning that these are likely conservative figures. In 2012, one out of every nine deaths was the result of air pollution-related conditions, and deaths attributable to both indoor and outdoor air pollution totaled approximately 6.5 million worldwide. > ENSIA: What Is It About This Soil That Protects Plants From Devastating Disease (Kayleigh O’Keefe). Plants around the world are constantly under attack—often with big implications for humans. Now, global change is giving these parasites an edge, helping spread deadly diseases around the globe. Desperate to find a way to fight back, some scientists have turned their attention to a special type of soil known as “disease-suppressive soil.” The plants that live in it seem to magically remain relatively free of disease, even if disease-causing parasites are present. These scientists hope to improve understanding of this phenomenon so they can use it to help make agriculture more sustainable. Today, advances in microbiological and sequencing technology are enabling researchers to tease apart the complexities of the microbes that live in soils—which organisms are they, exactly, and just what do they do? > New York Times: An App to Help Save Emissions (and Maybe Money) When Buying a Car (John Schwartz). How much is your car contributing to climate change? A new study can tell you. The research looks at 125 cars on today’s roads and measures not just their mileage and the type of fuel they use, but also the greenhouse gases generated in making the cars and, if they are electric vehicles, the greenhouse gases produced by the power plants that provide their juice. The result is an addictively clickable app that the authors hope will help car buyers make their next car purchase. There are surprises: A number of hybrids have a bigger carbon footprint than the lightest gas sippers among cars with internal combustion engines. The paper, by Jessika E. Trancik, a professor of energy studies at the Massachusetts Institute of Technology, and colleagues, noted that the cars with the lowest emissions also tended to be the cheapest, which undercuts the notion many people have that living a greener life is necessarily more expensive. > Carbon Brief: In-Depth: How Can Fossil Fuel Supplies Be Constrained? (Sophie Yeo). Academics gathered in Oxford this week to discuss how to constrain fossil fuel supply as part of efforts to tackle climate change. Climate change policy has focused heavily on reducing emissions through reducing demand, using familiar approaches, such as pricing carbon, increasing renewable energy and boosting energy efficiency. Discussion on constraining fossil fuel supply has been more subdued. While the Paris Agreement adopted in December 2015 invited countries to say how they would reduce their emissions, it did not broach the subject of how to tackle the central cause of emissions: fossil fuels. Tactics to constrain fossil fuel supply include removing subsidies, placing moratoria on new coal mines, placing a fee on fossil fuel production, creating funds to prevent fossil fuel development in developing countries, and persuading countries to hold back on approving fossil fuel infrastructure. > Minnpost: Farm Children Less Likely To Have Allergies And Asthma In Adulthood, Study Suggests (Susan Perry). People who grow up on farms are less likely to develop allergies and asthma in adulthood, according to an international study published online Monday in the journal Thorax. The study also found that women with a farm upbringing were more likely to have stronger lungs. These findings were remarkably consistent across many countries, “suggesting that farming effects may be due to biological mechanisms rather than socio-cultural” ones,” say the researchers. As background information in the study points out, the incidence of asthma and allergies has risen dramatically in recent decades. Many theories have been proposed for this increase, including the so-called hygiene hypothesis, the idea that a lack of exposure in childhood to various microbes and allergens (partly from living in homes that are “too clean”) can weaken the immune system and lead to illnesses. > Common Dreams-Shareable: New Report Finds People-Powered Energy Revolution: Here’s Why It Matters (Maira Sutton). Can you imagine a world where all businesses are owned and directly controlled by the people who depend on them for employment or essential goods and services? While we may not be living in that world today, cooperatives have already built such a reality for hundreds of millions of people across the globe. October is National Co-op Month in the United States, when people across the country will be celebrating the cooperative movement’s history and economic impact on communities nationwide. According to the Co-op Month website, “the annual awareness month provides a key opportunity to reflect on the legacy of cooperative impact and celebrate the many ways co-ops are building better businesses, better communities and, ultimately, a better world.” Fittingly, this year’s theme for the month is Cooperatives Build. > Yes! Magazine: A Strategy To Stop The Funding Behind The Dakota Access Pipeline (Bill McKibben). Virtually every name in the financial pantheon has extended credit in some form to the Dakota pipeline project (Food & Water Watch Report, a credit line of $10.25 billion to companies directly involved in building the project—from 38 banks that love such deals precisely because they’re so capital-intensive. Because federal tax breaks worth more than $600 million helped make the balance sheet for Dakota Access, such loans should come under new scrutiny—moral, as well as financial—since they assume that governments won’t enforce their Paris promises. That’s a gamble accountants might want to think twice about, Civil disobedience can be useful, as demonstrated by the amazing activists at Standing Rock forcing the federal government to pause construction earlier this month. Their inspiring nonviolent leadership should have sent a shiver down the spine of a few bankers. > Live Population: World Population Clock Live Watch the population increase minute by minute.